Boris Johnson, Britain’s foreign secretary, likes to clown around, even by his own admission. So much so, it seems, that when news emerged last week of an alleged massacre of children choking from chemical weapons in Syria, Johnson was still up for jolly-good fun. Take a look at the above picture again. This was taken at a summit in Brussels last week when some 70 nations assembled in the Belgian capital pledging financial aid for war-torn Syria. Britain’s top diplomat Boris Johnson was central to the proceedings. On the very same day, it emerged from Syria that more than 80 people, including dozens of children, were killed in an alleged chemical weapons incident in the town of Khan Shaykhun, Idlib Province. The politicians in Brussels immediately made political capital on the deaths. Johnson and other Western leaders, including US ambassador to the UN Nikki Haley, have cited those deaths as “evidence” of Russian “complicity.” Western media have been non-stop peddling the claims that Syria and Russia are to blame – without a shred of evidence. US Secretary of State Rex Tillerson is in Moscow this week to lay down an “ultimatum” to Russia to withdraw its military support for Syria. Within two days of the chemical weapons incident, US President Donald Trump ordered his warships to strike Syria with 59 cruise missiles, which resulted in several civilian deaths, including children. Where are the Western tears for those children? Or supposed Western principles for international law?The emotional denunciations that have emanated from Boris Johnson and others over the chemical weapons incident, accusing Syria of barbarity, were instrumental in creating a political cover for Trump’s subsequent military strikes. What actually happened in Khan Shaykhun is not yet known. Russia and Iran have condemned the US missile strikes as unlawful aggression against a sovereign state, and they have called for an impartial investigation into the previous chemical incident. But immediately, last Tuesday, Western governments and media began blaming the deaths on Syrian government forces dropping toxic munitions. Britain has absurdly accused Russia of being responsible for “all the civilian deaths” last week in Syria owing to its support for Syria. The only initial “evidence” on the Khan Shaykhun incident were videos and claims made by “activists” belonging to the so-called rescue group known as the White Helmets. That Western-funded group has been shown to be integrated as a “media outlet” for the Nusra terrorist network and have been implicated in fabricating propaganda videos, such as during the liberation of Aleppo at the end of last year, in order to smear the Syrian government and its Russian ally. The Damascus government denies categorically that its air force used chemical weapons in Khan Shaykhun last week, or at any previous time. It says, besides, that its chemical weapons arsenal was destroyed in a United Nations-monitored process under a 2013 decommissioning deal brokered by Russia. 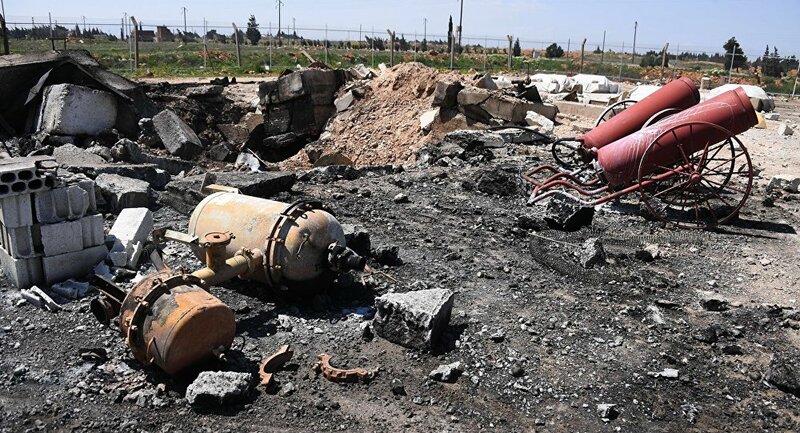 Russian military has said that the incident at Khan Shaykhun may have been caused by the Syrian air force bombing the militant base using conventional weapons, which could have resulted in an accidental release of toxic materials stored in an arms depot used by the insurgents. Alternatively, the militants could have deliberately deployed toxic chemicals on unwitting civilians for the despicable purpose of a false-flag propaganda stunt.The prompt video recording of dying children gasping for breath and the rapid dissemination of the images by Western media outlets raise suspicions. The same nefarious stunt involving mass murder by militants with lethal Sarin nerve agent was carried out in August 2013 near Damascus. To this day, Western governments and media continue to blame the Syrian government forces for that atrocity, when it has been convincingly demonstrated that it was actually perpetrated by the foreign-backed militants precisely for propaganda purpose. In any case, what actually occurred at Khan Shaykhun last week remains to be seen. Johnson is the lead voice lobbying the West to slap more economic sanctions on Russia as “punishment” for the alleged atrocity at Khan Shaykhun. Tellingly, he says there is a “window of opportunity” for Russia to withdraw its support for Syria and to assist Western powers to negotiate a “peaceful” settlement in Syria’s six-year war by removing President Bashar al-Assad. In other words, this “window of opportunity” is not for Russia, but rather it is for the Western powers to achieve their objective of “regime change” in Damascus. Washington and London are shamelessly using the deaths of Syrians to push their criminal agenda of regime change. First in the form of unleashing American military force directly in the Syrian conflict – a conflict that the Western powers instigated in the first place by using proxy terror groups. And secondly, by pressuring Russia into abandoning its Syrian ally with claims that Moscow is complicit in war crimes.The whole US-British double-act is nothing but a sordid charade to cover up for their own complicity in waging a covert war on Syria. The trumping up of war crimes charges against Syria and Russia over the alleged gas attack in Idlib last week is a sordid pretext to further the West’s aggression towards Syria. Russia has rightly dismissed the British foreign minister as a clown whose antics are a flagrant bid to play politics over Syrian deaths. As the saying goes, a picture is worth of thousand words. The image of Boris Johnson joking around with other world leaders in Brussels last week – as with his fooling around with other members of the G7 this week – shows a person who obviously does not believe in the gravity of what he is publicly claiming about “war crimes” in Syria. As children were choking from exposure to lethal chemicals, Johnson was all-too-evidently more concerned with joking. And playing politics for his master in Washington.Concerns about war crimes in Syria are real enough. But, primarily, those concerns should be directed at Washington, London and other Western governments, along with their regional allies in Turkey and Saudi Arabia, who have sponsored and armed terrorist proxies to ravage that country. The continued bombing of Syria by US, British and French warplanes, as well as now cruise missiles, resulting in thousands of civilians being killed is another category of monumental war crime. Western ultimatums to Russia over alleged war crimes are a base distortion of the truth about what is happening in Syria. One day, Western leaders should face prosecution for their crimes. Maybe then, just maybe, the stupid grin will be wiped off Boris Johnson’s face. It doesn’t take a military analyst to grasp that the American attack on a remote Syrian airfield contradicts every possible military rationale. If America really believed that Bashar Assad possessed a weapons of mass destruction stockpile and kept it in al-Shayrat airbase, launching a missile attack that could lead to the release of lethal agents into the air would be the last thing it would do. If America was determined to “neutralise” Assad’s alleged “WMD capability”, it would deploy special forces or diplomacy. No one defuses WMD with explosives, bombs or cruise missiles. It is simply unheard of. America targeted al-Shayrat because it knew with certainty that there were no WMD in that location. It was a fireworks show. It had no military objective. Trump was left with no other option: he needed a fireworks show to convey a clear image of a conflict between himself and Putin. He had to invent a war with Russia. We know who are the first to benefit from the current escalation. The Jewish State that gambled on regime change in Syria, in line with the sinister Yinon Plan, now accepts that Assad is here to stay. But here is the peculiar development: while the BBC, the Guardian, the New York Times and the White House refer to Assad and his “chemical warfare” with certainty, the Israeli press is actually very careful. The Israeli Ynet news website only refers to Assad’s “alleged” gas attack. The Israelis do understand that the story, as it stands, doesn’t make any sense. But there may be another narrative that could introduce some method to the madness. The CIA and the FBI do not seem to be drifting away from Trump and his ties with Russia. This weekend we learned that former Trump adviser Carter Page “gave documents to a Russian spy”. Carter Page, who was a foreign policy aide to the Trump before the election, met occasionally with Victor Podobnyy while the intelligence operative was working in the US. Podobnyy was one of three men indicted by the FBI in 2015 on suspicion of working for Russia’s SVR foreign intelligence service. We also learned this weekend that Trump’s son-in-law, Jared Kushner, failed to alert the FBI to several meetings he had with Russian officials despite a legal obligation to do so. His lawyer described the omission as an “administrative error”. The Guardian says the CIA actually reported to senior lawmakers in classified briefings last summer that it had information indicating that Russia was working to help elect Trump as president, a finding that did not emerge publicly until after Trump’s victory months later. President Trump has rejected any suggestion of a Russian connection as “ridiculous” and “fake news”. Trump could probably win over the liberal press but the CIA and FBI have proved harder nuts to crack. Trump was left with no other option: he needed a fireworks show to convey a clear image of a conflict between himself and Putin. He had to invent a war with Russia. The Mirror bought into this façade: “Donald Trump warned he is one step away from military clashes with Russia,” its headline read. It seems as if launching a missile attack on a deserted Syrian airfield while alerting the Russians in advance would convey the necessary patriotic image to the American people. It would convince the Ziocons that the White House is ready to launch World War III on their behalf. The attack was there to convince the American people that Trump is not a Russian puppet. Shockingly enough, the liberal press was very quick to toe the line. The uniquely banal Jonathan Freedland wrote in the Guardian today: “Sometimes the right thing can be done by the wrong person. Donald Trump’s bombing of a Syrian airfield seems to belong in that category.” Seemingly, the Guardian never misses an opportunity to rally for a Ziocon war. The only question that has remained open is whether such a drone blitz on a Syrian airbase will convince Trump’s constituency that by now “America is, once again great”. The Saudi focus on nuclear serves a variety of the kingdom’s goals: diversification of its economy, reduction of its dependence on fossil fuels, countering a potential future Iranian nuclear capability, and enhancing efforts to ensure that Saudi Arabia rather than Iran emerges as the Middle East’s long-term, dominant power. … Saudi Arabia’s close ties to the Pakistani military and intelligence during the anti-Soviet jihad in Afghanistan in the 1980s gave the kingdom arms-length access to his country’s nuclear capabilities. To advance its programme, involving the construction of 16 reactors by 2030 at a cost of $100 billion, Saudi Arabia established the King Abdullah Atomic and Renewable Energy City devoted to research and application of nuclear technology. Saudi cooperation with nuclear power Pakistan has long been a source of speculation about the kingdom’s ambition. Pakistan’s former ambassador to the United States, Husain Haqqani, asserts that Saudi Arabia’s close ties to the Pakistani military and intelligence during the anti-Soviet jihad in Afghanistan in the 1980s gave the kingdom arms-length access to his country’s nuclear capabilities. “By the 1980s, the Saudi ambassador was a regular guest of A.Q. Khan” – Abdul Qadeer Khan, the controversial nuclear physicist and metallurgical engineer who fathered Pakistan’s atomic bomb, Mr Haqqani said in an interview. Retired Pakistani Major-General Feroz Hassan Khan, the author of a semi-official history of Pakistan’s nuclear programme, has no doubt about the kingdom’s interest. “Saudi Arabia provided generous financial support to Pakistan that enabled the nuclear programme to continue, especially when the country was under sanctions,” Mr. Khan said in a separate interview. Mr Khan was referring to US sanctions imposed in 1998 because of Pakistan’s development of a nuclear weapons capability. He noted that at a time of economic crisis, Pakistan was with Saudi help able “to pay premium prices for expensive technologies”. The report said it was unclear whether “Pakistan and Saudi Arabia may be cooperating on sensitive nuclear technologies in Pakistan. In an extreme case, Saudi Arabia may be financing, or will finance, an unsafeguarded uranium enrichment facility in Pakistan for later use, either in a civil or military programme,” the report said. The report concluded that the 2015 international agreement dubbed the Joint Comprehensive Plan of Action (JCPOA) to curb Iran’s nuclear programme had “not eliminated the kingdom’s desire for nuclear weapons capabilities and even nuclear weapons… There is little reason to doubt that Saudi Arabia will more actively seek nuclear weapons capabilities, motivated by its concerns about the ending of the JCPOA’s major nuclear limitations starting after year 10 of the deal or sooner if the deal fails,” the report said. Rather than embarking on a covert programme, the report predicted that Saudi Arabia would, for now, focus on building up its civilian nuclear infrastructure as well as a robust nuclear engineering and scientific workforce. This would allow the kingdom to take command of all aspects of the nuclear fuel cycle at some point in the future. Saudi Arabia has in recent years significantly expanded graduate programmes at its five nuclear research centres. Saudi officials have repeatedly insisted that the kingdom is developing nuclear capabilities for peaceful purposes such as medicine, electricity generation and desalination of sea water. They said Saudi Arabia is committed to putting its future facilities under the supervision of the International Atomic Energy Agency (IAEA). Saudi Arabia pledged to acquire nuclear fuel from international markets in a 2009 memorandum of understanding with the United States. In its report, ISIS noted, however, that the kingdom could fall back on its own uranium deposits and acquire or build uranium enrichment or reprocessing plants of its own if regional tension continued to fester. It quoted a former IAEA inspector as saying Saudi Arabia could opt to do so in five years’ time. Saudi Arabia’s nuclear agency has suggested that various steps of the nuclear fuel cycle, including fuel fabrication, processing and enrichment, would lend themselves to local production. Saudi Arabia has yet to mine or process domestic uranium. Saudi insistence on compliance with the IAEA and on the peaceful nature of its programme is designed to avoid the kind of international castigation Iran was subjected to. Saudi Arabia is likely to maintain its position as long as Iran adheres to the nuclear agreement and US President Donald J. Trump does not act on his campaign promise to tear up the accord. Mr Trump has toughened US attitudes towards Iran but has backed away from tinkering with the nuclear agreement. They also are likely to persuade Mr Trump to try to put pressure on Iran to guarantee that it will not pursue nuclear weapons once the JCPOA expires in a little over a decade. That may prove a tall order given Mr Trump’s warming relations with anti-Iranian Arab autocracies evident in this week’s visit to Washington by Egyptian President Abdel Fattah al-Sisi and an earlier visit by Saudi Deputy Crown Prince Muhammad bin Salman. Israeli Prime Minister Binyamin Netanyahu addressed cohorts of Israel loyalists in the United States by video link last week at the annual conference of AIPAC, the American Israel Public Affairs Committee. Dinstein’s interference allowed Israel to falsely characterise the occupation as benevolent while presenting the Palestinians’ liberation struggle as terrorism. The reality of Israel’s oppression of Palestinians rarely reached outsiders. Transport Minister Yisrael Katz stepped up the threats… warning BDS leaders that they faced “civil targeted assassination”. But domestic critics have proved trickier. The Israel government has chipped away at the human rights community’s financial base. Media regulation has intensified. And the Ministry of Culture is cracking down on film productions that criticise the occupation or government policy. These are the first signs of the repression to come. The police minister, Gilad Erdan, has announced plans for a database of Israelis who support BDS, to mimic existing spying operations on BDS activists overseas. The information will help a “dirty tricks” unit whose job is to tarnish their reputations. For the moment, the Israeli-engineered backlash is working. Western governments are characterising support for a boycott, even of the settlements, as anti-Semitic – driven by hatred of Jews rather than opposition to Israel’s oppression of Palestinians. Anti-BDS legislation has passed in France, Britain, Switzerland, Canada and the US. NATO membership is opposed by the majority of Montenegrins, who were disappointed by Donald Trump’s U-turn on support for the military alliance, editor-in-chief of the IN4C information portal Gojko Raicevic told Radio Sputnik. NATO’s 1999 bombing of Yugoslavia is still fresh in the memory of Montenegrins, who remain implacably opposed to membership in the alliance, editor-in-chief of the IN4C information portal Gojko Raicevic told Radio Sputnik. “The Montenegrin government wants to join NATO, the people of Montenegro aren’t keen whatsoever to be a part of that criminal organization. This has been proven for years and years by protests and demonstrations, you name it,” Raicevic said. In addition, most citizens are opposed to NATO membership because it contradicts the country’s traditional ties with Russia and Serbia. Finally, Montenegrins are opposed because of the values that NATO represents, Raicevic said. Raicevic said that former Montenegrin President and Prime Minister Milo Djukanovic, who has dominated the country’s politics since becoming Prime Minister in 1991, is key to its political course.Djukanovic, one of the country’s richest individuals, started to pursue a course of integration with the EU and NATO after disassociating himself from his former ally in the League of Communists of Yugoslavia, Slobodan Milosevic. “Milo Djukanovic, who is not President or Prime Minister of Montenegro any more but remains chief of his party, is pulling the main strings in this story,” Raicevic said. On Tuesday, US President Donald Trump signed the US ratification of Montenegro’s NATO accession protocol into force, following its approval by the US Senate last month. NATO invited the Balkan country to join the military alliance in December 2015 and its accession protocol was drawn up for ratification by NATO’s member states in May 2016.Now that the US has ratified the protocol, Spain and the Netherlands are the only remaining member states which haven’t yet approved the move. In Montenegro itself, thousands of citizens have demonstrated against the government’s plans to join the military alliance that bombed the country in 1999. Despite that, the government has rejected calls for a referendum on the matter from opposition parties such as the Democratic Front coalition. A survey of public opinion by the market research firm IPSOS, carried out before the country was invited to the alliance in 2015, found that 57 percent of Montenegrins were opposed to NATO membership and 84 percent were in favor of holding a referendum, the Montenegrin newspaper Dan reported. The alleged chemical attack on Syria’s Idlib province became a formal pretext for the US to attack Syria and aggravate its ties with Russia, independent expert Igor Nikolaichuk told Sputnik. In an interview with Sputnik, independent expert Igor Nikolaichuk described an alleged chemical attack on Syria’s Idlib province as something that Washington used to prompt the further deterioration of relations with Russia and Syria.Last Thursday, at least five people were killed and seven others injured after the United States launched 59 Tomahawk cruise missiles at the Syrian military airfield in Ash Sha’irat, located about 40 kilometers (25 miles) from the city of Homs. US President Donald Trump said the attack was a response to the alleged use of chemical weapons in Syria’s Idlib province on Tuesday, which Washington blames on the Syrian government. Russian Foreign Ministry Spokeswoman Maria Zakharova, for her part, said that the US missile attack has nothing to do with attempts to uncover the truth about the use of chemical weapons in Idlib province. Russian President Vladimir Putin said following his talks with Italian counterpart Sergio Mattarella that the latest US missile strikes had been carried out despite any proof of the Syrian government’s involvement in the alleged Idlib attack. He was reminded of the United States’ UN Security Council address in 2003 that finally led to the invasion of Iraq. “This reminds me very much of the events of 2003, when US representatives in the Security Council showed alleged chemical weapons discovered in Iraq. This was followed by a military campaign in Iraq, which ended with the destruction of the country, an increased terrorist threat and the emergence of Daesh on the international scene – no more, no less,” he said. Igor Nikolaichuk said in this regard that “it is very important that President Putin made the statement at a meeting with Italian politicians who are adequately [informed] about the Syrian issue.””So let’s hope that the case will not be submitted to The Hague court, and that they will admit at the end of the day that it was fake news,” Nikolaichuk said, referring to Washington and the alleged Idlib chemical attack. “Under the current state of affairs, such an attack can be seen as a typical casus belli, a pretext to blow up Russian-American relations and the settlement process in Syria,” he said. Nikolaichuk recalled that a casus belli is usually never investigated by a court and is recognized only after an event takes place. As an example, he referred to the Gleiwitz incident, a false flag operation by Nazi forces posing as Poles on August 31, 1939, which was followed by the beginning of the Second World War. 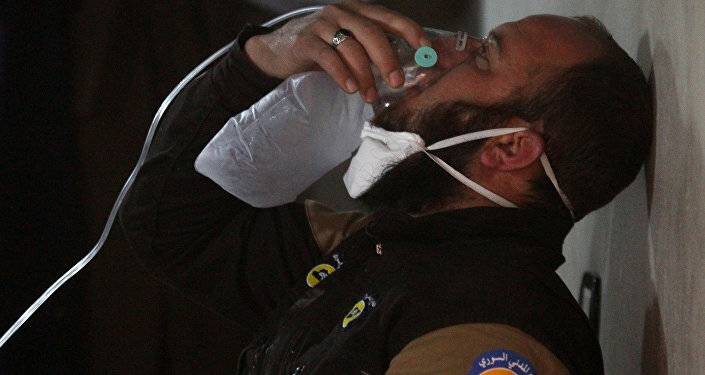 “As for this provocation related to the alleged use of chemical weapons [in Idlib], it is a concept of threats adjusted to the modern perception of an ordinary person, something that may be followed by a war,” he said. 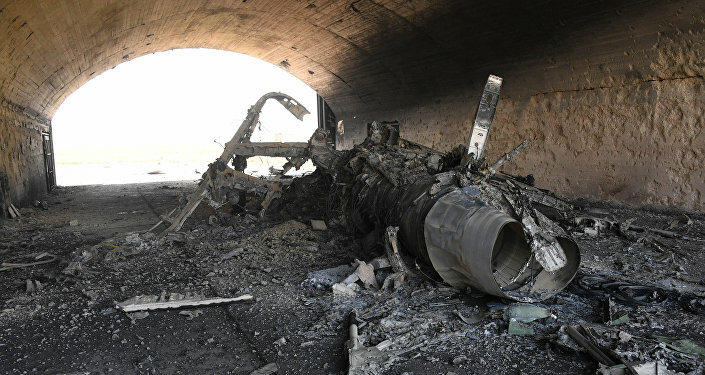 The Russian Defense Ministry said on April 5 that the airstrike near Khan Shaykhun by the Syrian air force hit a terrorist warehouse that stored chemical weapons slated for delivery to Iraq, and called on the UN Security Council to launch a proper investigation into the incident.Russian President Vladimir Putin said on April 6 that groundless accusations in the chemical weapons incident in Syria’s Idlib were unacceptable before the investigation into the matter had been carried out while Foreign Minister Sergei Lavrov on Saturday criticized the US missile attack as a violation of the international law. Konstantin Kosachev, the chair of the Russian upper house of parliament Foreign Affairs Committee, on Wednesday questioned the sanity of the US administration after White House Press Secretary Zionist Sean Spicer’s* comparison of the Syrian president to Nazi leader Adolf Hitler. MOSCOW (Sputnik) — During Tuesday’s briefing, Spicer tried to explain President Donald Trump’s outrage over Syrian President Bashar Assad’s alleged use of chemical weapons by claiming that even Hitler had not used chemical weapons on his own people. The spokesman then acknowledged that Nazis did use gas at “Holocaust centers” when challenged on the claim. “When Washington says that ‘Hitler did not even sink to using chemical weapons’ or offers Russia G7 membership in exchange for giving up support for Assad, doubts about the sanity of those running the United States start to increase in a geometric progression,” Kosachev said on his Facebook page. The senator expressed regret that people running the US administration have the world’s largest military force at their disposal. 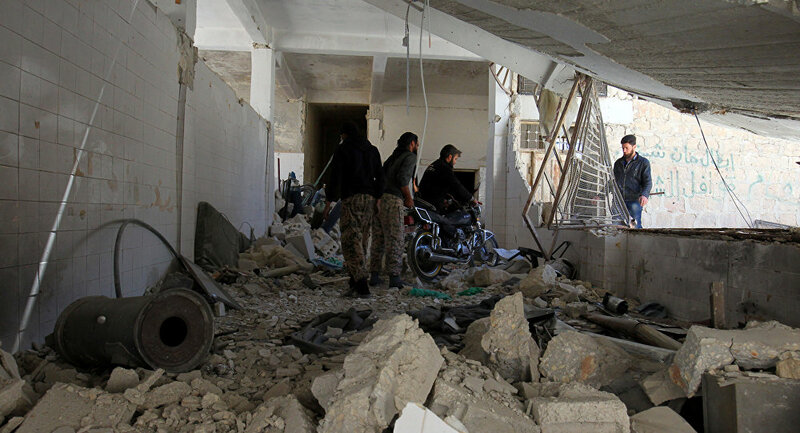 On April 4, the Syrian National Coalition of Revolutionary and Opposition Forces reported a chemical weapon attack in Syria’s Idlib province. According to recent data provided by the World Health Organization (WHO), 84 people, including 27 children died in the suspected chemical attack. 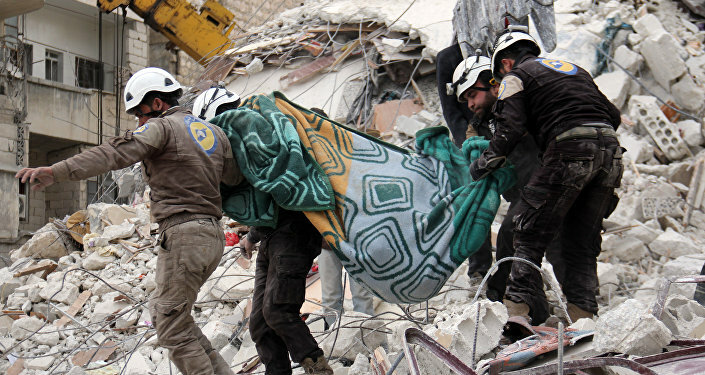 The Syrian foreign minister denied the government’s involvement in the Idlib incident, saying it had never nor would it ever use chemical weapons on either civilians or terrorists operating in the country.The Russian Defense Ministry said on April 5 that the airstrike near Khan Shaykhun by the Syrian air force hit a terrorist warehouse that stored chemical weapons slated for delivery to Iraq, and called on the UN Security Council to launch a proper investigation into the incident. Late on April 6, the United States carried out a cruise missile attack on the Syrian military airfield in Ash Sha’irat, located in the vicinity of the Homs city. US President Donald Trump said the attack was a response to the reported chemical weapon use in Idlib, for which Washington put the blame on the Syrian government. Washington is trying to legitimize its missile attack on Syria by forcing a UN Security Council resolution, Russia’s deputy foreign minister said. MOSCOW (Sputnik) — The United States seeks to legitimize its attack on a Syrian military airfield late last week by forcing a UN Security Council resolution, Russian Deputy Foreign Minister Sergei Ryabkov said Wednesday. “Attempts to push through the UN Security Resolution against this backdrop are nothing more than a desire to legitimize the attack,” Ryabkov told reporters. Russia could consider a version of the resolution on Wednesday that condemns Friday’s US missile attack on the Sha’irat air base, he said. “But since such an option is not proceeding, then there is nothing to talk about,” Ryabkov stressed. A Russian mission to the UN official said Tuesday the Security Council vote on a draft resolution submitted by the US, the United Kingdom and France was set for Wednesday afternoon. “In general, the [US] administration’s line with regard to Syria remains a mystery. Inconsistency is what comes to mind first and foremost,” Ryabkov said. Russian Foreign Minister Sergei Lavrov will discuss all aspects related to the Syrian conflict settlement efforts with US Secretary of State Rex Tillerson on Wednesday. “All issues related to the situation in Syria will be discussed during the forthcoming talks,” Ryabkov told reporters when asked whether the diplomats would discuss the establishment of safe zones. The deputy foreign minister added an emergency Organization for the Prohibition of Chemical Weapons (OPCW) session on Syria is scheduled to be held Thursday. He also said that Lavrov and Tillerson would discuss the Ukrainian conflict which is “undoubtedly, one of the main topics”. US President Donald Trump stressed that Russian President Vladimir Putin was supporting “a very bad man,” and he believed such an alliance would be bad for Russia and the entire world. MOSCOW (Sputnik) — US President Donald Trump blamed the current situation in Syria on Moscow’s support for country’s President Bashar Assad, calling the Syrian leader “an animal,” in an exclusive interview with Fox Business on Wednesday. He stressed that Russian President Vladimir Putin was supporting “a very bad man,” and believed such an alliance would be bad for Russia and the entire world. Commenting on recent US strikes on Syrian airfield, Trump stressed that he could not have acted differently. “But when I see people using horrible, horrible chemical weapons … and see these beautiful kids that are dead in their father’s arms, or you see kids gasping for life … when you see that, I immediately called General Mattis,” Trump said. 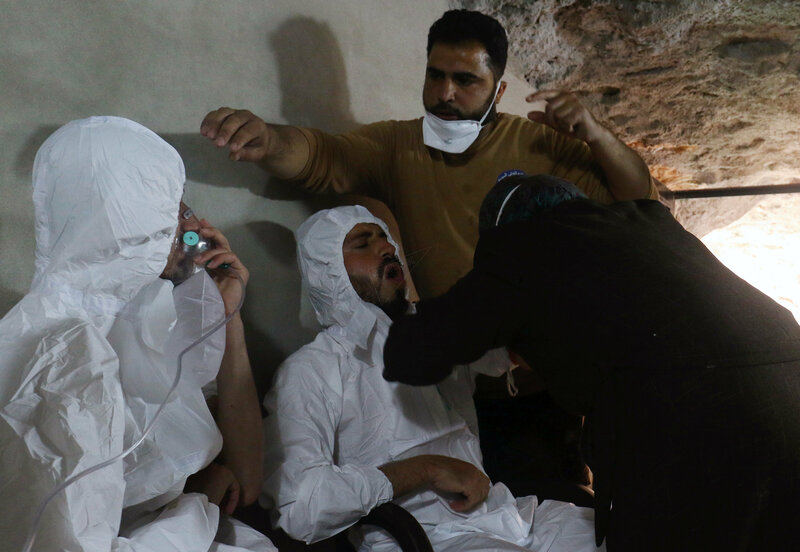 On April 4, the Syrian National Coalition of Revolutionary and Opposition Forces reported a suspected chemical weapon attack in Syria’s Idlib province. According to recent data provided by the World Health Organization (WHO), 84 people, including 27 children died in the suspected chemical attack.The West has quickly accused Assad government of using chemical weapons against Syrian people. Syrian Foreign Minister Walid Muallem denied the government’s involvement in the Idlib incident, saying it had never used chemical weapons on either civilians or terrorists operating in the country and will never do so. The Russian Defense Ministry said on April 5 that the airstrike near Khan Shaykhun by the Syrian air force hit a terrorist warehouse that stored chemical weapons slated for delivery to Iraq, and called on the UN Security Council to launch a proper investigation into the incident. The next day, Putin said that groundless accusations in the chemical weapons incident in Syria’s Idlib were unacceptable before the investigation into the matter had been carried out. On April 6, the United States launched 59 Tomahawk cruise missiles at the military airfield in Ash Sha’irat in response to the alleged chemical weapon use in Syria’s Idlib province.The chemical accident in Idlib and US strike on the Syrian airfield renewed calls among the Western countries to ouster Assad as a necessary precondition for the crisis settlement. Could Greece Really Turn the Page? Will Greece manage to complete its bailout programme this time? This is the question that is hovering in the air after on April 7 the Eurogroup agreed in principle on the fiscal and reformist path of Greece after the programme expires next year. Since February, the Greek news from the meetings of finance ministers of the euro area have been creating expectations that this time there might be a breakthrough, after last autumn’s stall of the implementation of the third rescue programme, agreed on in August 2015 to an amount of 86 billion euro. Details on what was agreed on last Friday are scarce as the deal has not yet been “dressed” in a written agreement. This will happen when representatives of the institutions (formerly the Troika) return to Athens, and this, according to the Ekathimerini newspaper, is expected to happen in late April. Eurogroup boss Jeroen Dijsselbloem (Netherlands, Socialists and Democrats) said at a press conference after the meeting on Friday that a reform package worth 2% of GDP was agreed on, which refers to the period after the completion of the programme in 2018. The Greek government is committed to reduce government spending by 1% of GDP in 2019, the main focus being on the pension system. The pension reform, which includes reduction of pensions, eliminating benefits, and increasing retirement age, is one of the two most problematic issues in the current Greece bailout programme. In 2020 the government will have to cut another 1% of GDP costs, this time the focus being on personal income tax. When representatives of the institutions and the Greek government sign the agreement, that would also clear the way for the “reward” for Greece’s serious reform efforts, and that is starting talks on a debt relief. 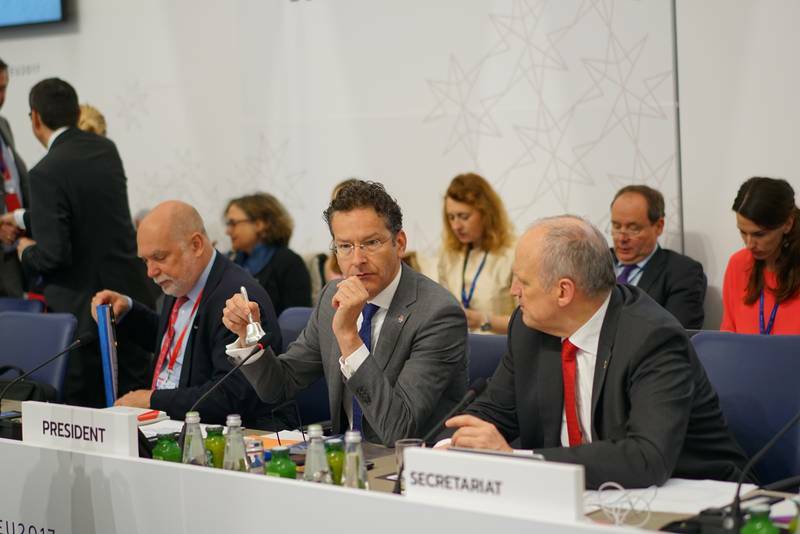 Jeroen Dijsselbloem stated that the biggest hurdles have already been overcome and the Eurogroup will be able to deal with the medium-term fiscal path for the period after the end of the programme as well as the sustainability of debt. The two things are inextricably linked and there is still no agreement on them between the euro area and the International Monetary Fund. IMF and Brussels differ significantly in their understanding of the results of Greece’s bailout programme on the sustainability of its public debt and what fiscal path should be followed in the medium term to allow the debt to be sustainable and to move towards its reduction. These differences are the reason the IMF has not yet participated in the programme. Based on his own analysis, the Fund believes that the set targets to generate a primary budget surplus (excluding payments on loans) from 1.75% this year, 3.5% next year, and 3.5% in the medium term are not realistic in order to lead to debt sustainability. Furthermore, the Fund believes that it can not be expected of Greece to maintain high primary budget surpluses (averaging 3.5%) for too long after the closing of the programme, and therefore demands that debt relief is agreed on. There is agreement on this maturing in the euro area already, but the question remains what form will this debt relief have. 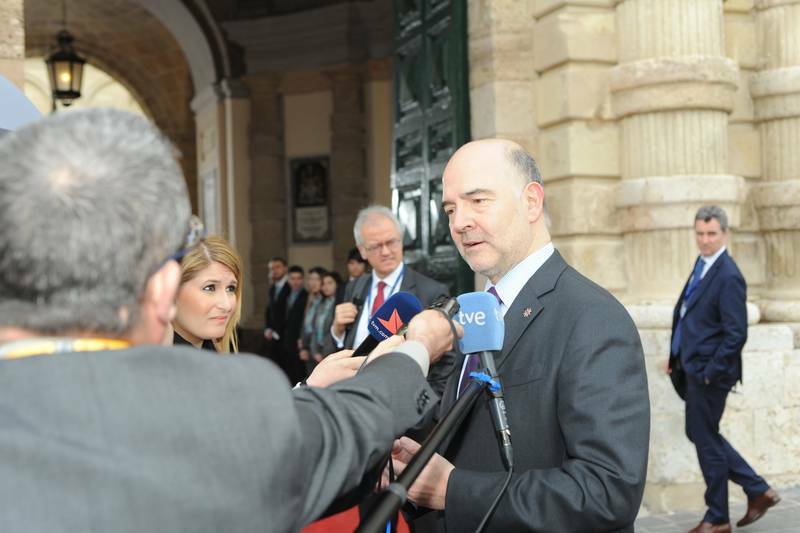 EU Economic Affairs Commissioner Pierre Moscovici (France, Socialists & Democrats) stated that Greece has achieved a surprising primary budget surplus of 3% last year, which was at least 6 times greater than the objective. This year, Greece is expected to reach 1.75% budget surplus and 3.5% next year. Earlier, during a debate in the European Parliament on the Greek rescue programme Mr Moscovici acknowledged that this goal cannot be pursued too long. 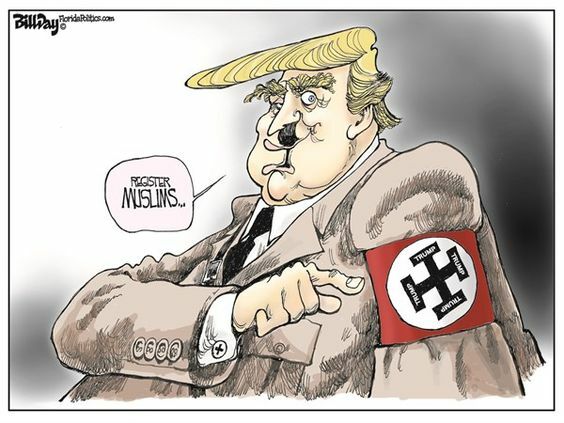 “It is not democratic”, he said. However, he stressed the need for Greece to record primary surpluses over the medium term. “We’ve been saying for a long time that a more realistic budgetary surplus target is necessary after the programme. We will not get reasonable market lending otherwise”, he remarked, but did not say how large these surpluses need to be. He added that Greece has surprised everyone with its economic performance last year. According to the winter forecast of the European Commission, economic growth in Greece was 0.3% in 2016 and is expected to be 2.7% this year. 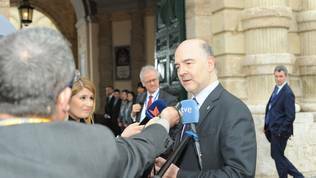 Pierre Moscovici expressed confidence in front of the MEPs that due to significant reforms and good economic performance, Greece will manage to turn the page. So far, more than 200 measures have been adopted since the start of the programme, which is a huge effort. Benoît Cœuré, a member of the executive board of the European Central Bank, said the deal signed on Friday gives grounds to starting talks on the sustainability of the Greek debt, which means also negotiating debt relief. He stressed that time is of the essence. Jeroen Dijsselbloem also agreed with this, saying there have already been too many delays. “The Greek economy in the 1st half of last year was picking up and that momentum is slipping away from us. So, we really need to work fast and have it done certainly well in time for the next payments”, said the head of the Eurogroup. The next tranche under the programme must be paid in July. The biggest obstacle on the subject of the Greek debt is Germany. The position of Chancellor Angela Merkel is against debt write-off. This will be one of the main topics of discussion in Berlin on Tuesday (April 11)between her and the head of the IMF Christine Lagarde. The outcome of these discussions and Germany’s decision is hanging to a great extent on the parliamentary elections this fall. Mrs Merkel’s government is seriously threatened by the emergence of a new candidate of the Social Democrats – former head of the European Parliament Martin Schulz, who has always supported the write-off of Greek debt, but the theme is toxic to German society. Whether because the end to the Greek saga is now in sight, or because eight years are too long, but the boss of the European Stability Mechanism (the euro area’s permanent bailout fund), Klaus Regling, made a surprise statement at the press conference following the Eurogroup on 7 April. 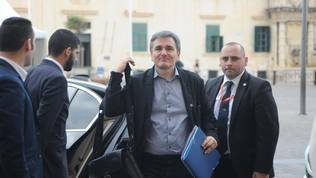 Usually, after Eurogroup meetings, he explains how much money has been allocated so far to Greece and sends messages to the Greek government to adhere to its commitments. This time, however, he reacted in an unusual manner. Instead of starting with Greece, especially after it became clear that an important agreement has been reached, he spoke about how important the other two topics on the agenda of the meeting of finance ministers of the euro area were – how to boost investment and how to improve the functioning of the banking system. In his words, these two topics are essential for the long-term functioning of the euro area. “But, of course, Greece is important. 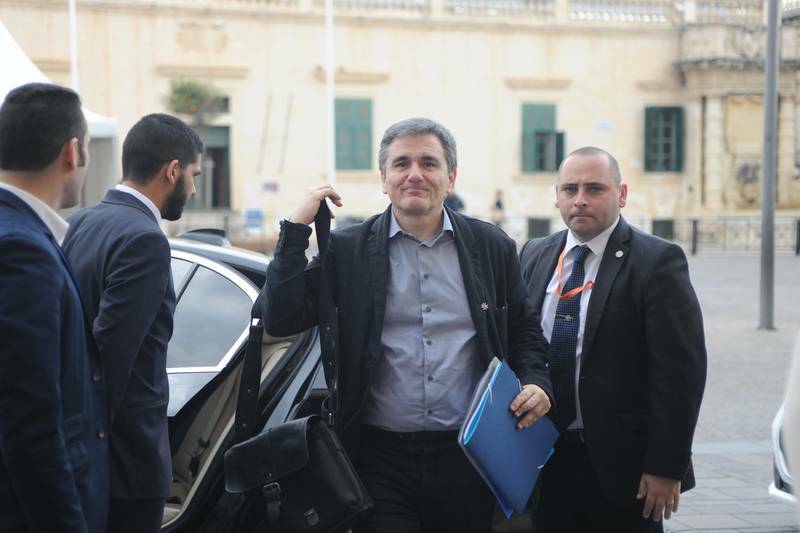 We tend to talk about primary surpluses these days, but I think in other countries people look more at the overall fiscal balance”, he said at a joint press conference in Malta. Elections in the Netherlands forced over the last few weeks the discussion about a successor to Eurogroup Chairman Jeroen Dijsselbloem. This was also one of the main journalists’ questions at the March Eurogroup, which took place in late March. Back then, the mood was one of full support for Mr Dijsselbloem and confidence that not only will he finish his term (which expires in January), but it is possible that he wins a second term. For the two weeks between the March and the April meetings of the Eurogroup many things have changed. The first is that the Labour Party (PvdA), of which Jeroen Dijsselbloem is a member, lost the elections catastrophically. That was the biggest piece of news from the vote in the Netherlands in late March. The party lost 29 seats and is left with only nine members or parliament, which makes the remaining of Mr Jeroen Dijsselbloem as minister of finance unlikely. The second change came because of Dijsselbloem himself, who undermined his already slim chances of staying in office. In an interview with the German financial daily Frankfurter Allgemeine Zeitung, he used words that sparked a huge scandal in the southern periphery of the euro area. According to him, one cannot spend their money on alcohol and women and then expect solidarity. 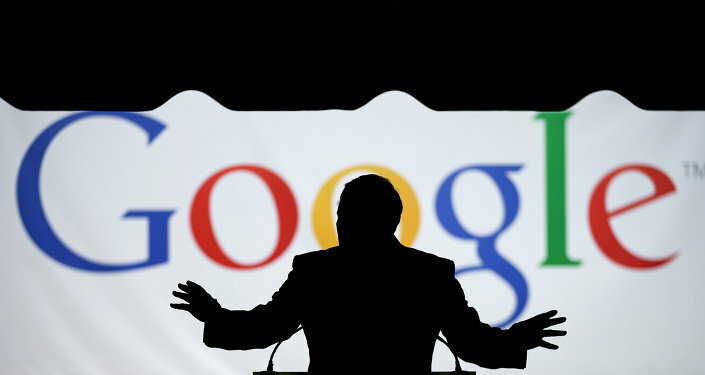 Besides from some southern capitals, sharp reactions also came from the European Parliament. Its President Antonio Tajani (EPP, Italy) and a group of MEPs condemned the remarks and demanded that Dijsselbloem attends a hearing in plenary. The Dutch finance minister refused attendance by pointing out that the date (April 4) is busy in his calendar. He also recalled that he was quite recently interviewed in the economic committee of the European Parliament. During the otherwise filled with populist rhetoric discussion, in which specific comments on the parameters of the Greece bailout programme and the country’s future after the end of it were sporadic, MEPs condemned the statement of the head of the Eurogroup and demanded an apology. 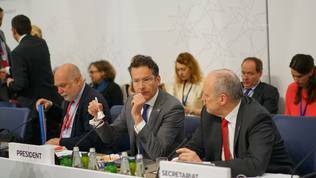 A few days later, during the meeting of euro area finance ministers in Malta, Jeroen Dijsselbloem apologised to his colleagues as well. He said he himself had raised the question and expressed regret for his choice of words, repeating that he had no intention of offending anyone. He stressed, however, that in order to have solidarity, it is important to respect the arrangements and promises. “The choice of words has regretfully caused pain for people and that ,of course, I regret very much”. In his words, no discussion followed and nobody asked for his resignation. It is not clear so far whether Jeroen Dijsselbloem is going to finish his term in office. It depends on the duration of negotiations on forming a new government in the Netherlands, since the rules of the Eurogroup state that its leader must be a minister in office. It is possible there will be a gap between negotiations and the end of his term (January), but it is still not clear how it will be filled. In March, some of his colleagues said that this is the preferred option, namely because of Greece, as Mr Dijsselbloem is far too familiar with the Greek dossier. The appearance of someone, who has yet to get acquainted with the situation in detail, particularly in a key moment for the programme, is not to the taste of some of the ministers. Dijsselbloem himself said in response to a journalist’s question, that he did not intend to break the tradition of careful selection and preparation of his successor. Ultimately, the post is not reserved for the minister of finance of the Netherlands. There are candidates for his seat already, the most prominent of whom is Spanish Finance Minister Luis de Guindos, who hoped last time to get the job, but lost it to Jeroen Dijsselbloem. The other candidate is Slovak Finance Minister Peter Kažimír. Other names are also mentioned. None of the Eurogroup ministers wished to comment on the topic of Jeroen Dijsselbloem’s resignation before or after the meeting of the Eurogroup, except Austrian Hans Jörg Schelling, who answered a question whether Jeroen Dijsselbloem should resign with a laconic “no”. Posted in GreeceComments Off on Could Greece Really Turn the Page?